More than 20,000 tonnes of rubbish, including hospital waste from the Republic, has been found during an investigation into illegal dumps in the North, authorities said last night. The Environmental Protection Agency in the Republic is assisting the massive cross-border investigation. 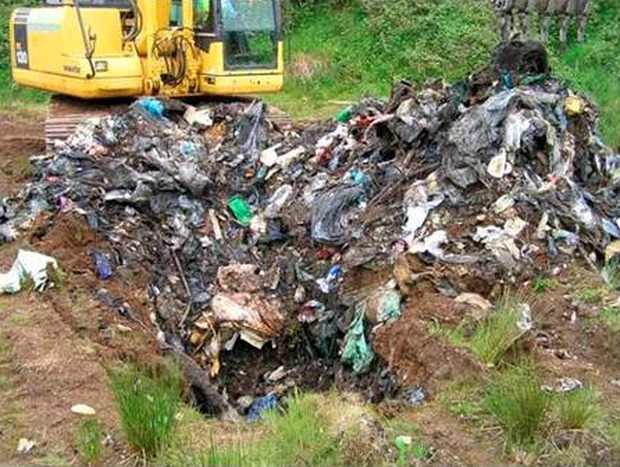 Industry sources say the rubbish dumped in rural areas of south and east Tyrone represented a multi-million-euro profit for the rogue dumpers behind it. All of the waste is believed to have originated in the Republic because, in the North, councils are responsible for removing all household and commercial waste. The initial estimate of the dumped waste amounts to a saving of €2.5m for a rogue operator in landfill costs, and costs to the State of around €300,000 in unpaid VAT. The Northern Ireland Environment Agency's (NIEA) specialist crime unit last night released a hotline number hoping for more information on those behind the dumps. The head of the unit, Derek Williamson, told the Irish Independent that investigations were at a "sensitive stage" but he is keen to hear from whistleblowers north and south of the Border as part of Operation Teak. The large piles of waste included tonnes of recyclable materials which householders believed would be used to create other products. It has been found at sites just outside Ballygawley and Sandholes and two sites in the Galbally area. All are within a few minutes' drive of the Republic. "The waste being dumped is significant in volume and includes household and commercial plastics, paper and textile wastes, broken and crushed glass contaminated with metals, plastics and paper, flaked and shredded plastics and medical waste," said Mr Williamson. His organisation has appealed for information from 1,200 householders living within a 3km radius of the sites in a bid to identify the illegal dumpers. "The individuals carrying out these crimes are using lorries, diggers and machinery to transport, off-load and bury this waste and we are asking if anyone has seen any similar activity which you may be concerned about to contact us," said Mr Williamson. "We have been in contact with our colleagues at the Environmental Protection Agency in the Republic and they are assisting us with our inquiries. "We do believe there are people out there, north and south, who have information which could help us to solve this crime and we would appeal to them to do the right thing and get in touch." He said he was reluctant to pinpoint the origin of the waste at this stage. Used intravenous tubes were found at the Ballygawley site but no traceable information was with them. "The amounts of money to be made by the criminals involved are vast," he added. A spokeswoman for the EPA said: "We are assisting with these enquiries. As the investigation is on-going we cannot comment further at this time." Anonymous tip-offs can be phoned to 048 9056 9453.